If you enjoyed the 80's poodle-hair rock music and the glam-rock style fronted by bands such as: Bon Jovi, Guns 'n' Roses, Warrant, Poison, Motely Crue, Slaughter, Extreme and Steelheart and cheer the time hair-metal ruled the Strip, you will absolutely love Youngblood! This is like a time-capsule that has been isolated since 1989 and opens up now like a Pandora's box. Out of my speakers stream groovy '80s rock that sounds so typical of the time, and it feels so fresh and refreshing that I get chills. I must honor Eönian Records for their commitment to re-publish old (almost) forgotten 80's bands that stood just on the doorstep to the breakthrough, when grunge smashed their rock-star dreams. In Youngblood, I find a super vocalist in 'Bobby Sisk', which makes 'No Retreat' to one of my absolute favorite records this fall. He has a high and stable pitch in his voice that is rare nowadays. Bobby has a voice hugely reminiscent of Mark Slaughter and with a wide range and a lung capacity that makes me extremely impressed. The songs are bombastic and have the right groove and energy. With dazzling guitars and heavy artillery in the rhythm section, this is a very pleasant retro-journey for nearly an full hour. 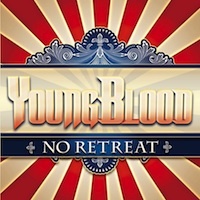 Party tunes mixed with several heavy rock tracks and some slower acoustic songs provide the near perfect album that should appeal to those fans (like myself), who like the easygoing and fun filled times Youngblood reflects in their music! The only negative thing I have to say, is that there are a couple of weaker filler tracks, which is the reason why the overall score is just below the magic 90 mark. With a killer debut album like this, I'm waiting for the rest of their songs from the good old days. Best tracks: "Pump It Up", "Sock It To Me", "Shot of You", "Taste of Your Lovin'" and "Back In My Life".